As part of the run-up PR-fest for Redline, a schlock-fest of a movie, actor Eddie Griffin "lost control" ( can someone say "publicity stunt?" ) of a $1.5 million Ferrari Enzo and crashed it in spectacularly excruciating fashion. 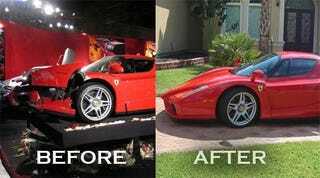 The car suffered major front end damage and most considered it totaled due to the delicate carbon fiber bodywork. Not Texan luxury car repair and salesman Matt Groner. No, Groner figured if he could get his hands on the Enzo, it had a fighting chance. As you can see from the picture gallery below, he was right. Jeez, who knew when we launched the "Save The Enzos" campaign, someone would actually save one? The dramatic video of the original incident, pictures of the carnage and Matt's exclusive story of how he brought the Enzo back to life are all below the jump. Here's the story: When the car got wrecked last March, I got a half a dozen calls from customers/friends asking me if I was going to buy the car? This is our business: We buy damaged high line cars. Not necessarily the celebrity cars, but they seem to own many of these type cars so it comes with the territory. My response to them at the time was "I doubt it since the whole world knows about the car." We were in contact with the proper people, but I really didn't think this car would happen. Then, late 2007, we got a call asking if we were interested in the Enzo? We headed to LA to inspect the car and if it was what we thought then the negotiations would begin. The car itself was not hurt and had a retail estimate to repair of $300k. So, the owner of the car already had that money and we had to come to an agreement on the car as-is. We did our negotiating over the phone through one of good friends in LA and a deal was reached. My guys left Houston one Monday afternoon with truck and trailer and were in LA with certified funds in hand on Wednesday. Thursday at noon Houston time I got a call from my guys telling me that the owner had changed his mind and we weren't getting the car. Needless to say I was not happy, but this guy had other cars that we were still negotiating to buy so I stayed clam. My guys dead headed back to Houston empty... A wasted week for us. 10 days later we got a call and the guy now wants to sell the car. This time the car has been moved to our LA contacts location and there's no "changed my mind" by the owner. The deal was done and the car was then shipped to Houston. We normally sell our cars in their damaged state. But, this car is special and everything bolts together. There is no frame to straighten ... it bolts to the tub. Just buy it and you're done. So, we ordered the parts and that where we are right now. 95% of the parts are here and we ready to make this car whole again. "Save the Enzos" I am trying.... Just need a little help from our Italian friends that make the parts. Please hurry. We Americans have no patience. Done... Finally! Attached are some pictures of the finished product. If I had to do it over again I would sell the car in it's damaged state and not repair it. Not because it was difficult to repair, but the time waiting on the Italians to supply parts is just ridiculous. I guess they have better things to do then to help "save an Enzo". Now that's it's done and I have had the privilege to drive the auto, I will say oh my, what a car! A true race car in everything it does. One trip to the track and I might keep it. Nope, not my style. Up for sale. Not $500k cheaper then the others on the market, but a little less. After-all, it's got a story. A pretty cool story though. There you have it folks, proof positive an enterprising entrepreneur with a little luck, some determination and a healthy budget can accomplish anything.